Later this week we will have the first post from Alisha Baginski (follow her on Twitter at @BAGINS_), Peace and Change’s student intern, who will be unveiling a digital project she created using StoryMap JS. Before the post debuts, I thought that I would introduce our readers to the digital tool that she is using and its applications in the classroom and beyond. StoryMap JS is an open-source tool that allows users to create web-based, multimedia-rich narratives that emphasize the importance of geography. Developed at Northwestern University’s Knight Lab, the tool can be used by those looking for a simple means of telling a story ground in space. Built using Knight Lab’s Gigapixel, StoryMap JS also allows for the creation of media rich stories that incorporate videos as well as photographs, maps, works of art and any other image file. Numerous news organizations, such as The Washington Post, Al Jazeera, Foreign Policy, and CNBC, have used StoryMap JS maps to report on events around the globe. However, the tool is not intended for journalists alone and has seen significant use in the classroom. At Colorado State University, students under Dr. Robert Jordan have created impressive projects using StoryMap JS, such as this student project that tracked indigenous language in North and South America. Because of the relative ease of access and engaging interface, StoryMap JS is a tool with potential for both educators and professionals. We at Peace and Change are excited by the opportunity to publish using the tool and introduce it to our readership. Call for Papers, Proposals, and Panels for “Two Centuries of Peacemaking” Conference in Newcastle upon Tyne this June! In June 2016 Newcastle University and Northumbria University – both located in Newcastle upon Tyne, UK – will jointly host a conference entitled “Two Centuries of Peacemaking”. The event will mark the bicentenary of the foundation of the (London) Peace Society whilst also relating to two other anniversaries: the centenary of Britain’s enactment of conscription during the First World War, and the run-up to the semi-centenary of Martin Luther King’s visit to Newcastle (where he received an honorary doctorate). I recently came across a unique, and very useful, digital archive documenting the history of San Francisco called FoundSF. The archive is a wiki – a website that is maintained and edited through the collaborative processes of its users – that catalogs and presents historical artifacts from the San Francisco area. It contains digitized newspapers, videos, and pictures of San Francisco and the communities that call it home. The themes of the collection found on FoundSF range from broad discussions on race, gender, and the area’s ecology, to remembrances of San Francisco theme parks and attractions. Although one should not take what is written on FoundSF as the gospel truth – and let’s be honest, most of the readers of Peace and Change are used to giving their sources a careful inspection – the documents held in the archive are fascinating. For example, there are interviews with activists that highlight the intersection of the Gay Rights movement with pro-FSLN activism in the 1970s and 1980s. 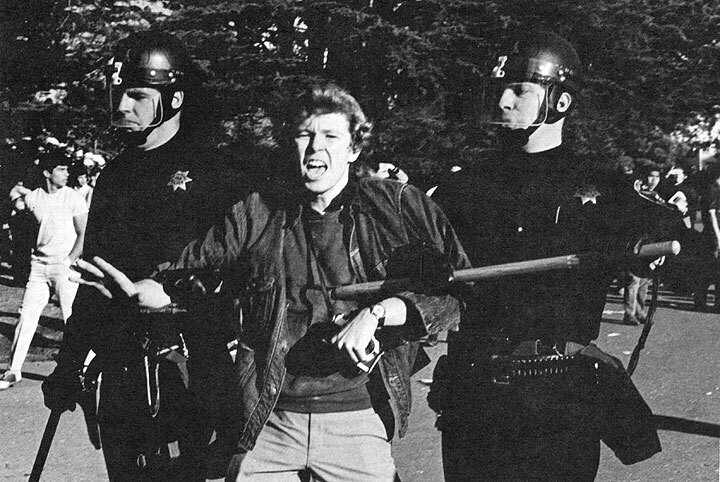 There are also remembrances of the 1968 San Francisco State student strike, accompanied by pictures of the unrest. Although admittedly tendentious, FoundSF is a treasure trove of documents detailing the turbulent history of San Francisco and is a valuable source for both researchers and educators. I am writing to request your participation in what I believe will be a significant publication for those of us interested in the history of the peace movement. I recently agreed to edit Opposition to War: An Encyclopedia of United States Peace and Antiwar Movements for ABC-CLIO. The best way to ensure the highest quality publication is through enlisting expert scholars as contributors. This work will include substantial entries ranging from 300-4,000 words, an introductory essay, chronology, general bibliography, cross-referenced entries, and photographs. I would greatly appreciate your participation in this project to whatever degree you are able. Information regarding this publication (such as available entries, essay length, guidelines, and compensation) is available on the website http://www.uspeaceencyclopedia.com. For anyone interested in writing, please submit a brief CV highlighting your scholarly activity, and a list of the available entries you would like to contribute. I would be happy to answer any questions you may have either through email at hall1mk@cmich.edu or by phone at (989-774-3374). Please respond at your earliest convenience.